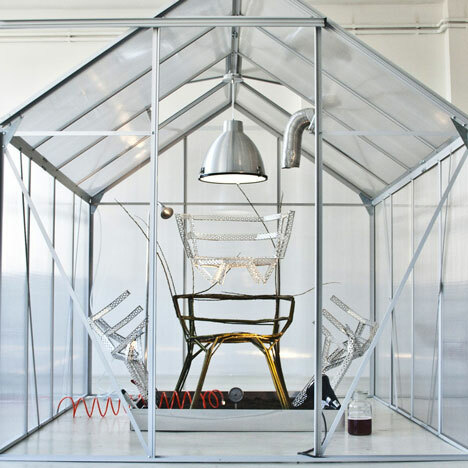 Milan 2012: designer Werner Aisslinger of Berlin and Singapore will present a chair growing inside a greenhouse at Ventura Lambrate in Milan this week. Shown as part of an exhibition of design from Berlin called Instant Stories, the Chair Farm project envisages furniture that's grown rather than produced and harvested locally rather than exported globally. The plant is trained inside a metal mould then released once it reaches maturity. In October we published a story about a building grown from cherry trees that won't be completed for 100 years - take a look here. The Ventura Lambrate design district is open from 17 to 22 April. Download the free map and guide here and see all our stories about Ventura Lambrate 2012 here. See all our stories about Werner Aisslinger here, including his Iconograph watch for Lorenz at Dezeen Watch Store. Photographs are by Nicolo Lanfranchi. Once again in April, the most recognised fair of the furniture industry opens its gates for design aficionados from all over the world. At the Milan Furniture Fair, visitors will witness a small sensation at “Instant Stories”, the special exhibition from Berlin at Lambrate: Amidst the platforms showing the latest in furniture design, a greenhouse is staged. Visitors are confronted with a gigantic box that gives the impression as if it has just fallen from heaven. This laboratory-like stage setup promises to be as spectacular as watching a dinosaur hatch from its egg: A chair is born from a steel corset! The only difference to the egg-comparison is the fact that the shell of the “chair farm” prototype is inside the chair’s structure instead of being outside. After the removal of the corset, a unique chair is revealed – truly singular, because nature cannot be programmed to deliver a certain result. The chair is no longer produced in the classical sense of the word. Instead, it grows of its own volition in a greenhouse or on a field. When it has reached maturity, the steel corset is opened and removed, revealing a naturally grown chair. The title of the project by this Berlin-based designer, who imagines huge “product plantations” in the future, reflects this utopian means of production: the “chair farm”. Strawberries in winter, pumpkins in spring – everything is possible. But since the early 80s, or since discounters have moved into urban environments instead of staying out of towns, we have been witnessing a contradictory movement: a wish to return to a more primary and genuine way of living. Global markets with their unpredictable mechanisms increasingly intimidate consumers. More and more people are discovering the advantages of buying and consuming regionally grown seasonal products - advantages such as eating healthier, saving resources and being environmentally friendly. People know and care about their CO2 footprint. They want to make their own decisions about which resources they tap to eat, live, travel, etc. This new and different state of mind centers on leaving the role of a passive consumer and becoming an active, mindful individual. Home-grown food is harvested and stored. A new activism is blossoming. At the same time, a re-orientation towards collective living and working spaces is taking place. A good example for this is urban gardening, where residents open and share their garden space instead of having small individual allotments. In Berlin and other cities, project teams have formed which trade different kinds of services – car sharing, sofa surfing and urban gardening are no longer mere fashion statements. People are discovering that life in all its multitude is much too beautiful to wrap it up in sanitized and ready-to-eat packages according to EU and DIN regulations. A cheer to the unconventional and surprising things in life! This structural change has also influenced the world of product design. Many designers have anticipated the change towards green design or eco-pluralistic design and have recognized it as a chance - one of the most prominent ones being Werner Aisslinger from Berlin. He has been experimenting with new materials and sustainable production methods for years. Aisslinger’s first technological experiment with polyurethane foam used in the automotive industry was serialized in 1996 by Cappellini and was added to the permanent collection at the Museum of Modern Art (MoMA) in New York in 1998. This was the genesis of the “Juli chair”, an integral part in the world of modern design. His first synthetic gel-furniture “soft cell” caused a sensation at the Salone del Mobile at the turn of the century. The “soft cell” lounge chairs found an enthusiastic audience with their mixture of medical technology, two-plane TechnoGel, and slightly transparent honey-combed upholstery in space-ship optics. In the following years, Aisslinger turns to different design worlds: He designs the ideal work space for vitra, builds hotels which live up to their name, and with “loftcube” he creates the true 21st century dacha. In 2011, Aisslinger achieves another major coup in regard to chair design: The “Hemp chair” is made of natural fibers that are turned into a high-tech composite by using an environmentally friendly water-based binder (Acrodur). The chair is hardened by strong heat and mechanical pressure without producing hazardous or toxic substances. The Hemp chair is lightweight and has a cardboard texture – masking its extreme resilience and durability. This chair received a great deal of attention at the Furniture Fair in Milan last year, clearly standing out with its curved, organic shape and its subtle color among all other designs in the colorful sea of novelties. The development from “Hemp chair” to “chair farm” was merely a logical consequence in Aisslinger’s work. It is a further development in his three-component master-plan: sustainable production, new materials, and an outstanding simplicity in design. One of Aisslinger’s main concerns is the cutting edge between aesthetics and everyday culture. He commutes between Berlin and Singapore, where he maintains a second studio. From a bird’s eye perspective, structural connections often seem clearer than on the ground: In an airplane with a view of the Indian Ocean, Aisslinger wondered if food and everyday products will still be decentrally produced and shipped around the globe in the future. As a matter of fact, tendencies such as “urban farming” and “integrated farming” are not merely the eco-utopian dreams of urban Bohemianism. They are at this moment tested and tried on the rooftops of Paris or Berlin and surpass the output and efficiency of industrial agriculture by a factor of 15. So Aisslinger is convinced that food production in urban spaces – giving everyone the possibility of becoming a passionate producer of agricultural products – will be the future in regard to quality and sustainability. Therefore, he thought about a way to invert production in furniture design back from globalized serial manufacturing to resource-conserving local production. And he came up with the answer: Chair farm is as simple as it is radical. Aisslinger states his intention as wanting to offer design-users a chair that is made with as little resources and as reduced an amount of waste as possible.